One of my favorite moments of the whole year happens on Christmas Eve. Yes, you can probably guess it’s the singing of Silent Night with the candles, but probably not for the reason you think. It’s what happens right before it. When the world (or at least the church) is dark. Darkness. It’s a profound thing. It is the symbol, the tangible evidence of everything that is lonely, scary, and sad. The church goes completely dark and I sing the first verse of O Come, O Come Emmanuel, I speak the words of Genesis and John 1. When God proclaims light I strike a match. God said “Let there be Light” “Ptchhhh” the match strikes and flame appears, so vivid, so bright in the midst of the great darkness. I’ve been walking in deep darkness this week. We lost a beloved member of our staff, it’s a crushing blow, he was my creative partner, my friend. He resigned to deal with a a crisis in his life. I’m heartbroken. I’m in the dark about where to go and what to do, about how to move forward. 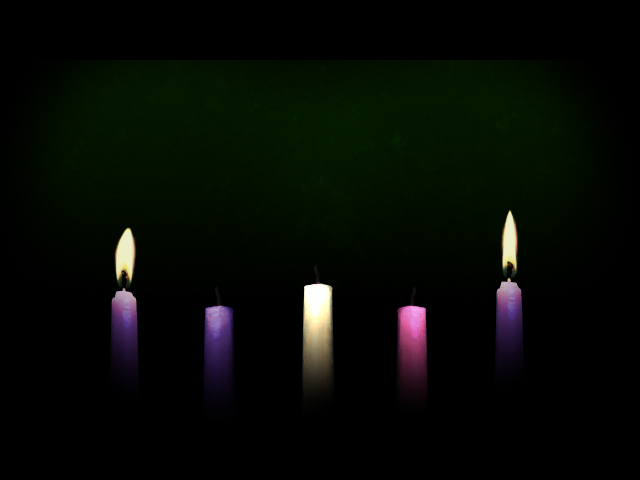 Today as I watched the Advent Wreath be lit in the first service I realized that the first candle brings the most light. I’ve been reflecting on how this is the Hope candle. If you light a candle in the midst of darkness the room is flooded in light, no matter how small the light, any amount of light overcomes the darkness. It literally is painful on the eyes at first. It’s a miraculous things to watch, it’s one of the most beautiful images of God’s love I have ever witnessed. But as you add to the light (as we did today) it’s not quite as satisfying as that first candle. We are making progress, the amount of light has literally been doubled, yet it is not as miraculous for some reason as when something was formed out of nothing. Yet again, there is a turn. On Christmas Eve we will light all five candles and then spread that light throughout the room and the light, the love of God entering the world is overwhelming. I am always sad on Christmas Eve for those in the congregation, I wish they could see what I see. I see a room flooded with light, a candle illuminating each face, some smiling with their families proudly, some silently weeping from heartbreak. It is one of the most beautiful sights I have ever seen. Each candle a representation of God’s love for them. Every candle a remembrance that the light shone in the darkness, and the darkness, the darkness cannot, will not, and shall never overcome it. For the people who walked in darkness have seen a great light. As we add to our candles each week this is my hope and my prayer. Amen. This entry was posted in Ministry, Prayer and tagged Advent, advent wreath, Christmas, christmas tree, Darkness, hope, light, love. Bookmark the permalink.